'Anti-Sharia' Marchers Met With Counter-Protests Around The Country : The Two-Way "March Against Sharia" participants said the Islamic moral code is a threat to U.S. society and women's rights. Counter-protesters accused them of racism and Islamophobia. Counter-protesters respond to the "anti-sharia" rally in Seattle on Saturday. Protesters who gathered on Saturday to denounce Islamic law were met across the country with equally sized or larger counter-protests. Organizers called the "March Against Sharia" rallies to protest what they say is the threat to U.S. society posed by the set of traditional Muslim practices, which they say includes oppression of women, honor killings, homophobic violence, female genital mutilation and other abuses. 'March Against Sharia' Planned Across The U.S. 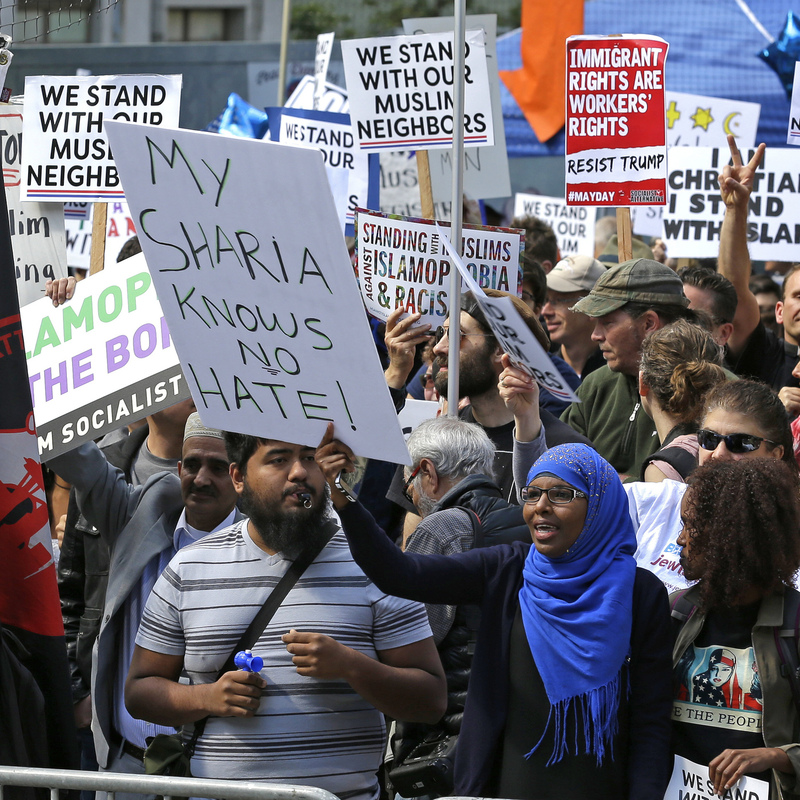 But reports and pictures show large counter-protests around the country, with activists accusing the "anti-sharia" marchers of racism and Islamophobia. Sharia "is a legal or philosophical code derived from Islamic scripture and meant to guide the behavior of observant Muslims," as NPR's Tom Gjelten noted. Religious experts say it's similar to parts of Christian and Jewish customs. The rallies were held in about two dozen cities and about 20 states. They were organized by the conservative group ACT for America, which the Southern Poverty Law Center calls the "largest grassroots anti-Muslim group in America, claiming 280,000 members and over 1,000 chapters." The organization describes itself as "the NRA of national security." "I feel like we need to make a stand now, before [sharia] makes more inroads," protester Shannon Boulogne told WABE reporter Adhiti Bandlamudi. "I've always been, you know, for women's rights." Bandlamudi reports that Boulogne was among a small group of demonstrators who gathered in Atlanta's Piedmont Park. The Los Angeles Times reports they were met by a "small gaggle of counter-protesters," who "held up placards and shouted, 'No Hate! No Fear! Muslims Are Welcome Here.' "
A few miles away, other Atlantans held a counter-protest and food drive. Asma Elhuni, of the Georgia chapter of the Council on American-Islamic Relations, criticized the "anti-sharia" protesters. "If they're against sharia, are you against feeding the poor? Are you against being friendly, showing love? Because essentially that is Sharia," she told Bandlamudi. In Syracuse, N.Y., "March Against Sharia" organizer Lisa Joseph told North Country Public Radio's Brian Mann that she put the rally together because she and others are "against female genital mutilation, honor killings, throwing gays off of buildings, stoning people to death." Counter-protesters in Syracuse responded by shouting "Shame! Shame! Shame!" and described the opposing demonstration as anti-Muslim bigotry, Mann reports. On the other side of the country, several dozen "anti-sharia" protesters gathered at Seattle's City Hall, according to The Associated Press. But the AP reports that "[h]undreds of counter-protesters marched through downtown Seattle behind a large sign saying 'Seattle stands with our Muslim neighbors.' "
In Chicago, "about 30 people demonstrated against Islamic law and in favor of President Trump," but twice as many counter-protesters shouted back, the wire service reports. "Each side boasted about 150-to-175 people" in a protest and counter-protest in Denver, according to The Denver Post, and law enforcement arrested four people. 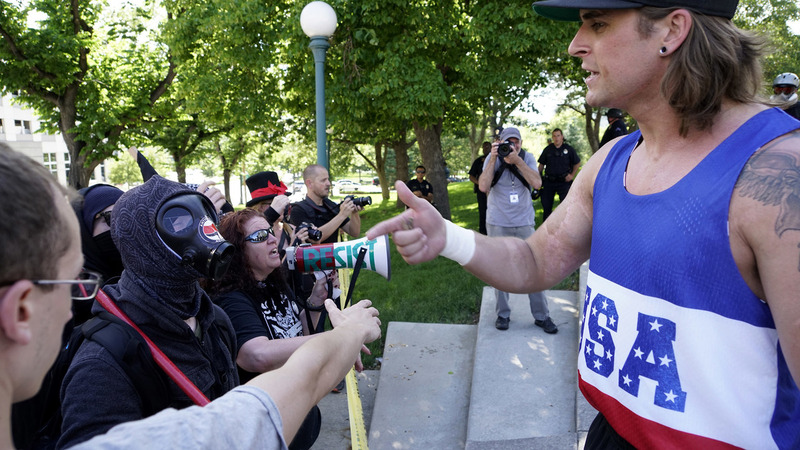 A participant (who refused to give his name) in the "Denver March Against Sharia" speaks to counter-demonstrators on Saturday in Denver. In Harrisburg, Penn., about 60 "anti-sharia" protesters were separated from the same number of counter-protesters. "This is a march against sharia, not Muslims," Steven R. Moore, of Washington County, Pa., told The Washington Post. "We are not affiliated with any extremist groups. ... Sharia is a barbaric system that the Islamic State is trying to impose in our country." 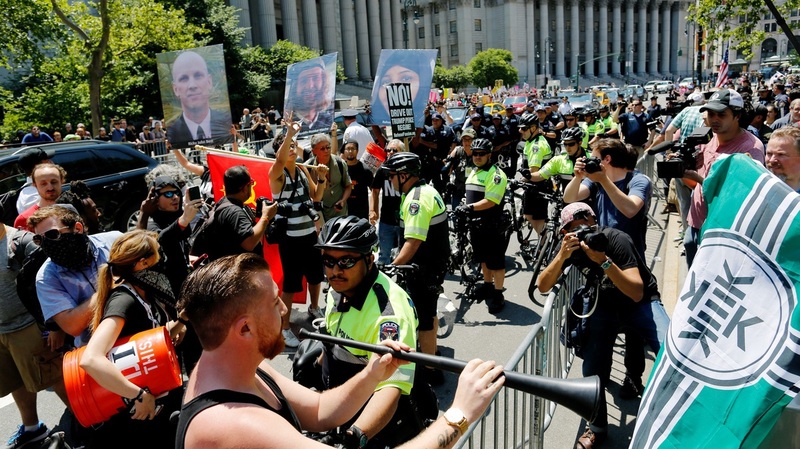 Several counter-protesters were "anti-fascist" or "antifa" activists, who "dressed in black masks and hoods and chant[ed] 'No Trump, no KKK, no fascist USA,' " Reuters reports, a slogan modified from a 1980s punk song. Similar protests and counter-protests also happened in St. Paul, Minn., where authorities arrested several people "when scuffles broke out," the AP reports, and New York City, where counter-protesters banged pots and pans in an effort to drown out "anti-sharia" demonstrators. NYPD officers try to separate counter-protesters and activists rallying for the "March Against Sharia" on Saturday in New York City. Despite the concern, sharia has no chance of being imposed in the U.S. in the foreseeable future. "It's like the Ten Commandments for Muslims. It's nothing to be enforced upon anyone. It's a moral code that I follow for myself as an individual," Muslim youth leader Mansoor Shams explained to NPR earlier this year. No area of the U.S. has legally implemented sharia, despite false reports on social media that Dearborn, Mich., enacted it. According to the Pew Research Center, the U.S. has a population that is only 0.9 percent Muslim; and Liyakat Takim, a professor of Islamic studies at McMaster University, told the AP that the vast majority of U.S. Muslims oppose implementing sharia in the U.S.
Then there's the Constitution, which states that "Congress shall make no law respecting an establishment of religion, or prohibiting the free exercise thereof."